Dr. Francis Ras of PITAHC facilitates the first public hearing for the National Competency Standards for Hilot. 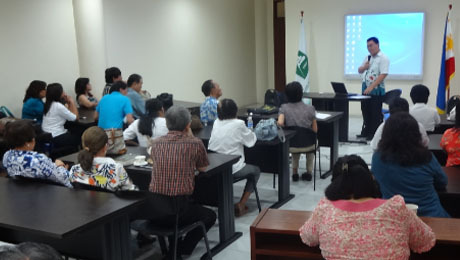 QUEZON CITY, Philippines- A big step toward the official recognition of Hilot practitioners took place on May 28, 2014, with the first public hearing for the National Competency Standards for Hilot held at the Conference Room of the Philippine Institute for Traditional and Alternative Health Care (PITAHC). The Association of Traditional Health Aid Givers Philippines, Inc. (ATHAG), led by founding president Dr. Bibiano S. Fajardo, actively took part in the public hearing. The activity was a very welcome next step for ATHAG, which is part of the Technical Working Group that has been working on the draft of the Competency Standards for Hilot since October 2013. A short prayer from Dr. Carmencita Yap of Hilot Pinoy got the public hearing to a solemn start. This was followed by a round of introductions from the 35 individuals who gathered for the activity—a mixture of Hilot practitioners, proponents of other traditional, alternative, and integrative healing modalities, and observers from the academe. Dr. Francis Ras of PITAHC explained how the standards came about, and gave a brief overview of the activity at hand. Afterwards, he went over the provisions and details of the draft competency standards for Hilot. A lively discussion ensued during the hearing, with several thought-provoking questions raised by participants regarding various aspects of both the standards and the Hilot tradition itself. One of the highly-relevant questions was from Dr. Rommel Tinio, an integrative medicine practitioner, who asked about the position of these standards with regards to the Philippine Medical Act, which expressly limits the practice of medicine (physical examination, diagnosis, treatment, operation, and prescription of remedies) to registered doctors of medicine. Dr. Ras responded that the standards for Hilot are covered by R.A. 8423, or the Traditional and Alternative Medicine Act (TAMA) of 1997. Another controversial topic was the inclusion of “orasyon” or “bulong,” a unique Filipino modality deeply ingrained in traditional healing practice. Often misunderstood by the general public, the “orasyon” or “bulong” is actually a series of syllables that allows the healer to direct energy to the patient in order to create needed changes in the body (for example, to temporarily relieve pain). While some participants questioned its inclusion in the standards, the long-time traditional healers stressed the need to include it, because it is an integral part of Filipino traditional healing. Dr. Fajardo explained what the “orasyon” or “bulong” is all about, and emphasized why it should be included. Mr. Joey B. Guttierez of the United Healers League of the Philippines, Inc. wholeheartedly agreed. He pointed out the critical role of the standards in preserving the Hilot healing tradition, and underscored the point that the Hilot tradition should be preserved in its entirety. Dr. Christian Mancao, a natural-born healer who developed the Mancao Myofascial Release Technique, expressed his support for this idea, and exhorted participants to open their minds to preserve these key elements of Filipino culture. With the multiple points being raised by the participants, it was decided that PITAHC would be giving one month for participants to submit their inputs on the standards, which would then be taken up at the next meeting of the Technical Working Group.